I have been meaning to make Fletch a chore chart or "visual schedule" as they are now called for some time. I think his crazy 3-year old self needs some structure and visual cues of what he needs to get done each day. There are so many ideas out there on the interwebs, and I just could not make a decision on how I wanted to proceed. We were at the big box toy store to replace Fletch's bubble gun, when I decided to check and see if they had chore charts. After finding an employee that actually knew where things were in the store, she directed me to the right place where I came across the Melissa & Doug Chore Chart. I am a sucker for a cute design, plus I knew this would save me a ton of time. I am a serious DIY-er, but now that I have a 3-month old in the house, time is a precious commodity. There are other chore magnets included that aren't shown, but those are geared towards older children. I like that they included stuff for the little guys and the big guys, that way we can adapt as Fletch gets older. They also included 2 blank white magnets. I used one to include potty goals. If Fletch gets all 7 magnets for the day, he gets a quarter to put in his piggy bank and we'll do something special. For instance, last Friday's special treat was a glow in the dark bath. I had bought some glow-stick bracelets from the Target dollar section, not knowing what exactly I was going to do with them. On a whim, I remembered a Pinterest post. You just add a few to the bath tub and turn off the lights. Fletch thought they were totally awesome and played with them all night (and even took them to bed). They might have kept him up longer than I had liked, but oh well. We also purchased some glow in the dark bubbles, so that may be his treat for tonight. In addition to needing some guided responsibilities...we really needed to reign in the TV time. I have been bad about letting him watch more than he should since Wyatt came into the picture (especially on those mornings when everyone was up way earlier than they should be). We would say "OK Fletch, this is your last show" and he would agree, but then of course later he would ask for another show, "Mommy...I want another show. This is my last show." In order to limit our TV time, I have instituted TV Tokens! I knew those canned juice top lids would come in handy eventually! I did a little doodle and laminated them, then stuck them on to the lids. Fletch gets 4 tokens per day. I explained that once he uses up his tokens, there will be no more shows for the day. He doesn't quite understand how to spread them out throughout the day, but he hasn't thrown any fits about running out of tokens...yet. It's very easy to just say "No more tokens, no more TV." Eventually he'll catch on, and will save some for later in the day. In any case, it makes things clear cut and eliminates me from being the bad guy. So that's what's new with Fletch. He starts pre-school in 3 weeks! I can't believe it. I know he is going to have a blast and I know I am going to enjoy my 3 hours of time with just one kid. 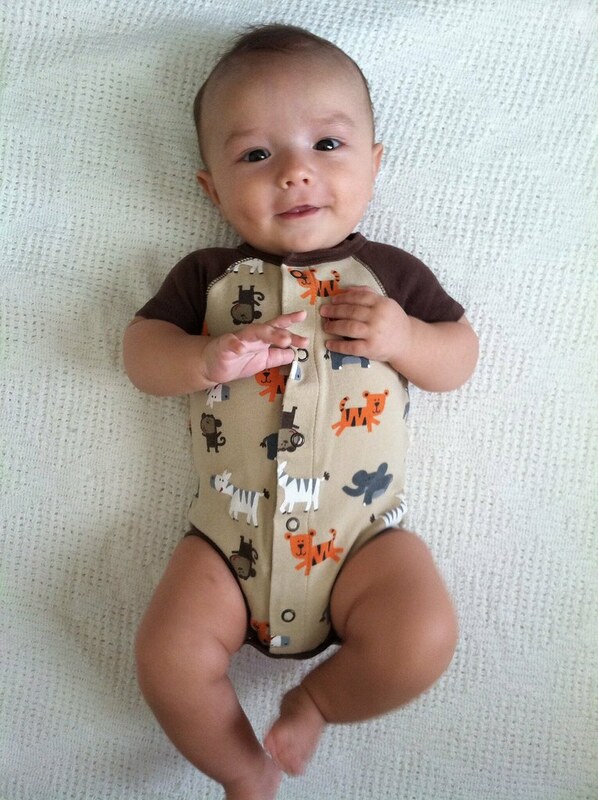 As for Wyatt....this boy just hit his 3-month growth spurt and he JUST KEEPS GETTING BIGGER! I know that is what babies are supposed to do, but jeesh. We are headed on an adventure this weekend, so stay tuned for some more family antics! I love all of the things in this post! Especially the TV tokens! Going the Distance...for Ice Cream!